App entrepreneur Trevor McKendrick makes a lot of money from an app he created to improve on several existing but poorly-implemented Spanish Bibles. How he did it is really instructive, especially if you’ve discovered you’re not the first person to think of a version of your app idea. Trevor found something that was popular, but poorly executed. The Spanish Bible apps that were popular on the app store showed that the idea was a good one — people were willing to pay for a badly done app rather than not have it all. “If customers were willing to pay for this really, really bad app, maybe I could make something better,” he told the Startup podcast. So Trevor hired a developer to help him execute his improvements. And he had some success. But it wasn’t until he added new value to the app — audio features — that the app clicked and really took off. Adding audio features turned out to be the big idea that really differentiated Trevor’s app from the others. When Trevor began thinking about app development, he had a goal of an app that could pay his rent, earning maybe $600 per month. When he implemented audio, he surpassed his goal by a factor of 10, and was earning $5,000 to $6,000/month. Since spinning off the audio features into their own app, It’s a passive income he says grew to “six figures” before he sold it to Salem Media in 2015. So it’s not just enough to have the idea on making an improvement; your improvements have to come to life. And Trevor recognized what you, as an app entrepreneur, have recognized: If you’re not a coder or a software expert, you need to hire a good developer and get them to bring your vision to life. Developers will have architects, graphics designers, programmers, project managers; in short, all the resources needed to execute your vision. They’ll work closely with you to ensure that you have an app that’s not just functional, but attractive and desirable. If your idea is a good one (and it probably is with the right details,) an app developer will help you create the best version of it you can. You really just have to commit to seeing the project all the way through to completion. An unfinished project gets no downloads — no clicks, no hype, no buzz. No revenue. Your first version of your vision (say that 10 times fast) may not be perfect, and that’s actually part of the process too. “I’ve found that if I don’t give myself permission to be awful I never start anything,” Trevor says on his blog. Even if you’re not sure what to do with your app idea, and you don’t know who to work with, a good place to start is by speaking with a qualified app developer. 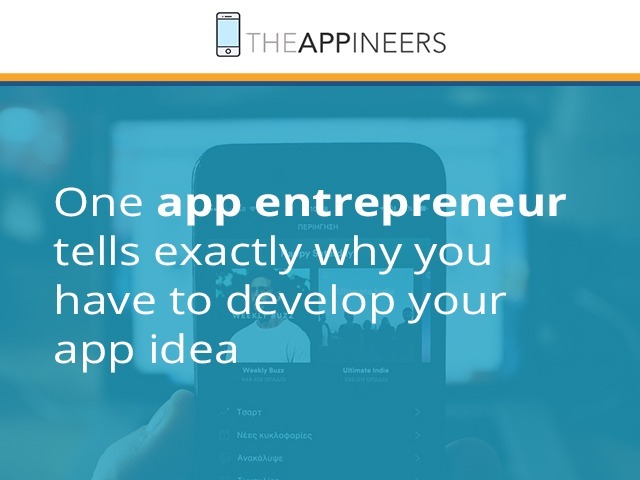 When you call The Appineers there’s no obligation, and you can learn a lot about the potential of your app without having to try building it yourself. Call us now (877) 534-1301 or fill out the form below to learn more how we can help with your app idea today!